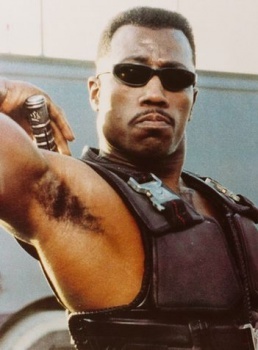 A federal judge has sentenced Blade actor Wesley Snipes to three years in prison on tax evasion charges. Despite raised concerns regarding the fairness of his trial, actor Wesley Snipes (Blade, To Wong Foo Thanks For Everything, Julie Newmar) is going to jail for three years. Snipes was sentenced today for a 2008 conviction of willfully failing to file tax returns and obstructing the United States Internal Revenue Service. Not only did he probably want to avoid jail, Snipes was actually hoping to have the convicting trial thrown out entirely. According The Hollywood Reporter, "two jurors sent emails to Snipes' lawyers alleging that other members made the conclusion that he was guilty before the trial officially started...one of the witnesses Kenneth Starr, who recently pleaded guilty to fraud, gave a "tainted" testimony against Snipes." Snipes' lawyers were hoping that these perjury accusations would result in a new trial, but no dice. U.S. District Judge William Terrell Hodges ruled that "The Defendant Snipes had a fair trial; he has had a full, fair and thorough review of his conviction and sentence by the Court of Appeals; and he has had a full, fair and thorough review of his present claims, during all of which he has remained at liberty. The time has come for the judgment to be enforced." Snipes is required to surrender himself to the authorities, but the time and place of that surrender is currently unknown.